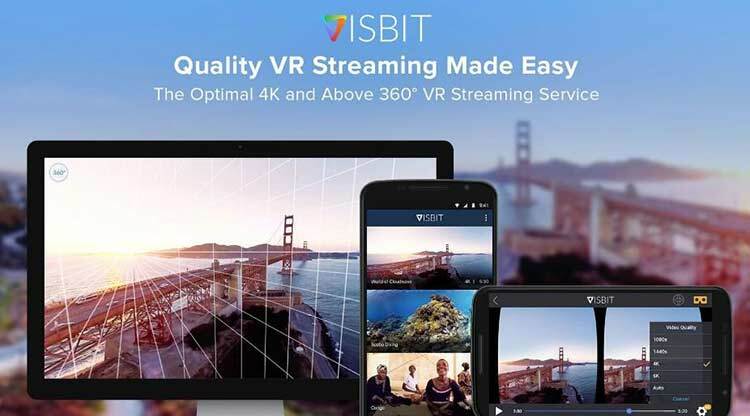 Visbit has unveiled a web based VR player and Unity SDK which will expand the all in one Virtual Reality Streaming services to all the web browsers. The Unity SDK will also support Google Daydream View and Cardboard iOS. Visbit has made a significant development in the recent times. Visbit already supported Samsung Gear VR and Cardboard for Android. The Unity SDK stands out when developed Android apps for Google Cardboard as it uses the patented VVOS technology. This allows the 4k and above resolution streaming over regular WIFI and LTE networks with negligible latency. The VR player released by Visbit is compatible with almost all web browser. It allows smooth playback of 360 VR videos that too in 4K and stereoscopic and can do so in VR modes on Chrome, Edge, Safari, Firefox. The best this is that the videos are protected by domain level privacy which means that the videos will only be played when the IP owner wants. The company has also changed its pricing structure which includes Web Only plan for those who do not need the advanced features for mobile apps. There is also a free plan for beginners which will help them understand how the technology works. The company aims at a secure transmission of VR videos on all the web platforms so that customers can experience the VR videos anywhere and anytime.